Imagine it’s 2008. Facebook is a mere shadow of its current size, and it’s easy to imagine that the website would forever be just an addictive waste of time, albeit one on a huge scale. But flash forward to 2011, and it’s hard to not to conclude that Facebook has transformed itself from a diversion into the central hub around which we organize our social lives. Let’s sum up: There are half a billion people on earth on Facebook, which amounts to 1 in every 13 people alive; in the U.S., a whopping 72% of the internet-connected audience has a profile. But these numbers fail to capture the role that Facebook actually plays in many people’s lives. Among 18-34-year-olds–that is, the most hotly sought after demographic–48% check Facebook right when they wake up. (And so we can guess that they also checked it right before they went to bed.) Over New Year’s weekend alone, 750 million photos were uploaded. 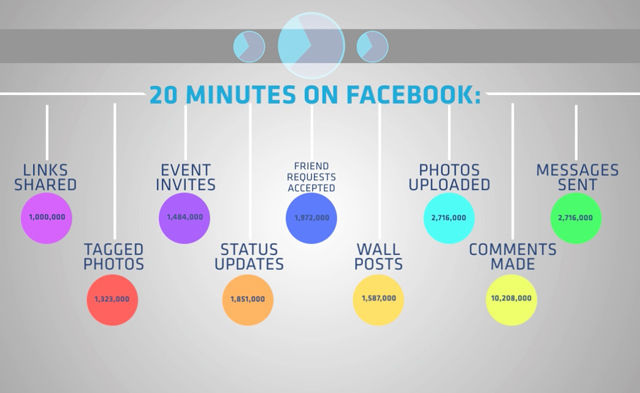 Every 20 minutes, 10 million comments are made, and 2.7 million messages are sent. In other words, not only are we “Facebook obsessed,” but for a growing portion of the world, if an event or thought or relationship isn’t documented or shared somehow on Facebook, it’s like it never happened at all.